Sydney FC have shrugged off last week’s loss to Perth, beating Adelaide 2-1 in a sputtering match at Jubilee Oval in Kogarah. Adelaide, still in desperate need of a striker, were again undone by their shoddy finishing and frazzled final-third play. Sydney, playing under a summer haze, weren’t especially convincing, but were carried by two perfectly executed set-piece goals. Adelaide’s high press, which worked well for them last time out, was present early here; it is always worth testing Sydney with a vigorous press, especially early, because Josh Brillante and Brandon O’Neill’s passing deteriorates quickly when under enough pressure. Additionally, because the fullbacks by design are sent up the pitch when Sydney have control of the ball, opportunities can be found in the wider areas they vacate, if the opponent can force a sudden turnover. Eight minutes in, Ben Halloran stole in to pinch a pass and released Nikola Mileusnic to probe in those wider areas, behind Michael Zullo on the left. 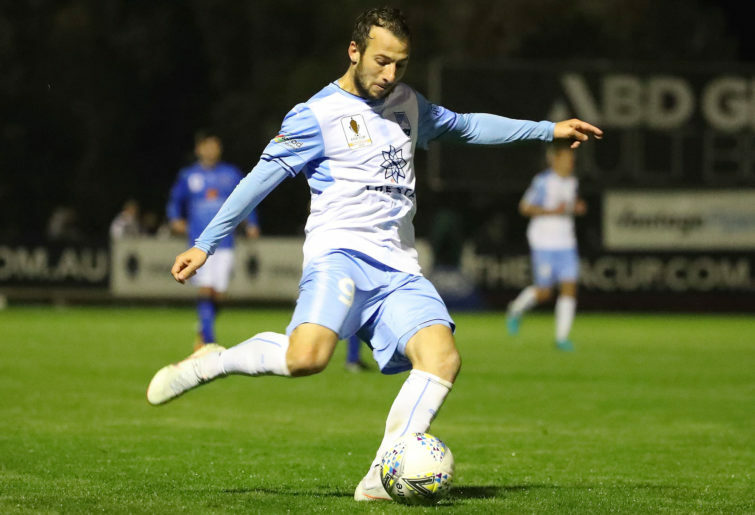 Daniel De Silva started for the Sky Blues; for all of Paulo Retre’s versatility, and occasional flash of flair on the ball, de Silva – comparing both at their best – is Sydney’s more dangerous option. It has been a slow burn for the winger, used as a substitute for the first half of the season; perhaps he will assume the starting spot from now on. It was another of Sydney’s attacking recruits, Siem de Jong, who cracked open this contest. A loose pass in the Adelaide defensive third saw Milos Ninkovic dart across and intercept. He was brought down right outside the box, scythed down by a tackle that had also glanced a piece of the ball. Questions over the validity of the foul aside, Paul Izzo duly constructed a wall and took his position in the goal. Evidently, his faith in the wall was rather less than certain, as when de Jong whipped a vicious shot into the corner of the unguarded side, Izzo was left stranded in the middle, having cheated a little toward the side of the goal the wall was designed to block off. De Jong’s free kick was so well placed that Izzo may not have gotten to it even if he had stayed put on his designated side. It’s the second dead ball the Dutchman has bashed in this season, and put Sydney in front. 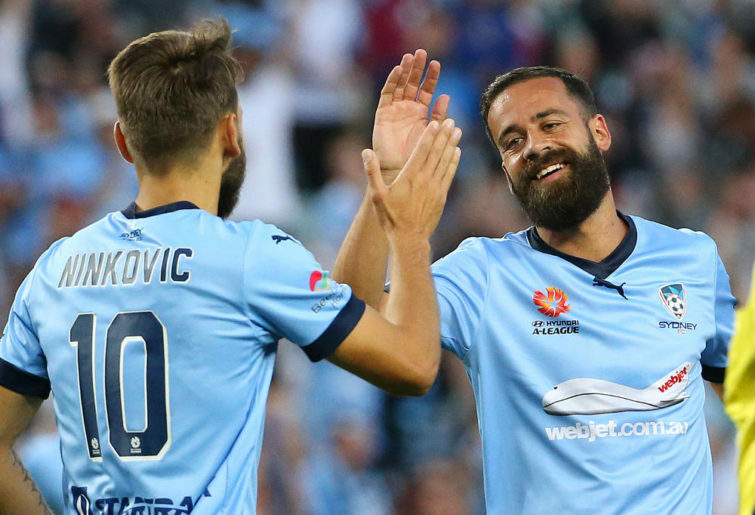 Sydney’s attacking scheme caught the eye; playing de Jong in Brosque’s second striker’s role, it looked a little unusual to start with, but the shape it assumed at times was even more striking. De Silva, Le Fondre, de Jong and Ninkovic seemed to settle occasionally into a flat front four, all teetering on the collective shoulder of the Adelaide defence. 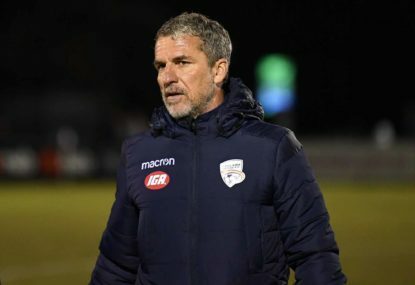 It looked not unlike the Socceroos’ system that Graham Arnold tinkered with in the early friendlies – although less so in the first two Asian Cup games – perhaps an example of convergent thinking between Steve Corica and his former boss. 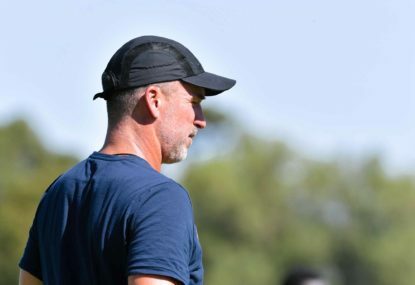 Ken Ilso, leading the line for the Reds – a phrase used as loosely as possible when talking about Adelaide – had a chance just before the half hour mark, as a looping header dropped on top of him after a scramble following a free kick. A bicycle kick would have worked a treat, and the limp header he nodded backwards indicated it may have been the preferable finish. Ryan Strain cracked a shot in from distance which was deflected and had to be hacked clear. Having conceded, Adelaide were seizing the lion’s share of possession, but were only able to fashion these half chances. Jordan Elsey decided to shoot audaciously from distance, as the game crept toward half-time; the shot careered into the stands. It was a warm day in Sydney, and it had turned into the sleepy kind of evening where the sun mellows, and the temperature adds weight to the eyelids, calling for little more than a cold drink and a comfortable veranda. Sydney, having taken the lead, were playing in a manner in keeping with this image, content to sit back, test Adelaide a little on the break, and coast toward half-time. Another set piece allowed Sydney to settle back into an even more contented stance a few minutes into the second half, as Jacob Tratt headed in a second goal from a corner. 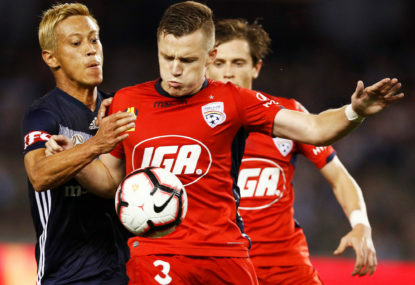 An unchecked run allowed the makeshift right-back – standing in for absent Roo Rhyan Grant – to connect truly with his forehead, with Adelaide players all tussling with their men, forgetting to attack the ball. But the comfort of that two-goal cushion was quickly whipped out from underneath the Sky Blues when George Blackwood drove past Aaron Calver and into the Sydney box. A tangle of arms saw the Adelaide forward lurch forward, tumbling over in a way an arm tussle wouldn’t force, but a penalty was awarded nonetheless. Blackwood had been a half-time sub, but it was Craig Goodwin who stepped up and slotted the ball past Andrew Redmayne. 2-1, and Sydney’s smooth sailing had hit a squall. The game opened up a little, with the intensity raised and the play see-sawing back and forth. Still, too often the ball would flow freely through the midfield, before the teams would tighten up and jitter in the final third, with over-play or indecision often the culprit. Sydney had the ball in the back of the net, but what would have been de Jong’s second goal was correctly chalked off for offside by the VAR. De Silva was subbed for Brosque. 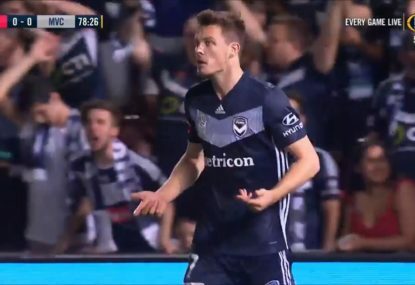 Tratt, who had morphed suddenly into an attacking weapon, stung Izzo’s palms with a howitzer shot, and Brosque nearly had a tap-in from the rebound. Sydney were probably creating the better chances, even though Adelaide were enjoying as much of the ball. Marco Kurz brought on Michael Marrone and Ryan Kitto, two bolters to push for an equaliser. Halloran had a chance, after a streaking run and cross down the left, but let the ball squirm through his legs. He was surrounded by a maw of players, not exactly the environment that might accommodate a precise finish even for a dedicated striker, which Halloran isn’t. By this time, with the game running in fits toward the final whistle, Corica had replaced Ninkovic with Retre, perhaps a sign that the 2-1 lead was enough to defend until the end. Brosque had a golden chance to seal the game, played in by a terrific header from de Jong. 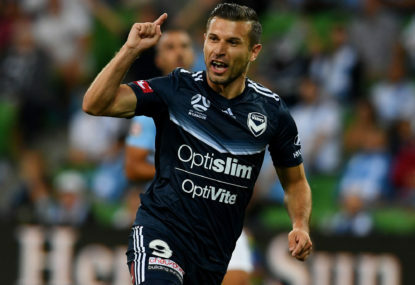 Clear through, with Izzo rushing out, Brosque decided to put his foot through the ball, smashing a shot wide, when a dinked finish – like the one that sealed his hat-trick against the Mariners – would have been far better. Adelaide had a series of corners, late in the day. Nothing came from them, with Sydney now simply clearing for distance. Mileusnic struck a beautiful bending shot past Redmayne and in from the left-hand side, wheeled away to celebrate, but was disappointed to find the goal flagged offside. Then Adelaide crafted what looked like a sure equaliser: Blackwood did excellently to play in Marrone, whose cross dribbled all the way from the right of the Sydney box through to Kitto on the other side. Kitto’s shot, though, was repelled superbly by Redmayne. Kitto had all the time and space to place his shot so as to give the keeper no chance, but didn’t and Redmayne saved the three points for his team. The whistle went a few seconds later. 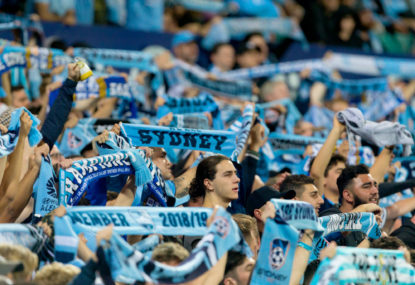 Sydney were not exactly convincing, taking two set pieces to score their two goals, but were able to offer more of a cutting edge than their opponents. This isn’t hard when playing Adelaide, who had more than enough possession and advanced field position to have scored more than they did, but who were again let down by bluntness and a lack of clarity in the final third. “The crossing into the box was not so good, at times,” Goodwin said of his team’s performance after the game, he himself responsible for a few of Adelaide’s best and worst efforts. “At the end of the day we didn’t have that little bit of quality, and we made it hard for ourselves,” Goodwin added. Indeed.